Since we were visiting San Diego over the holidays and couldn’t celebrate New Years Day in Japanese style this year, my mom and I decided to make this festive Japanese Azuki Beans & Rice called Sekihan after we came back from the trip. 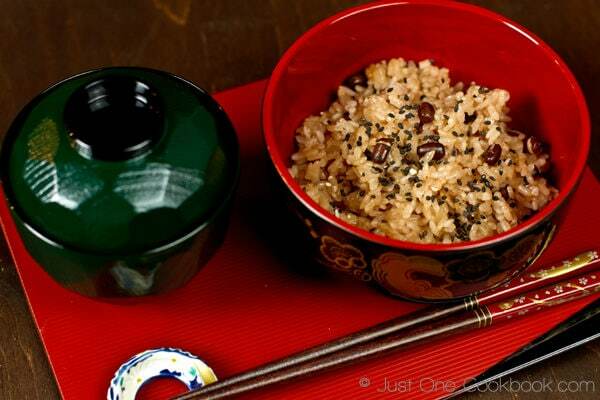 Sekihan literary means “red rice” in Japanese because the rice is red from cooking with red Azuki beans. It’s a traditional dish served during New Years, birth of baby, birthdays, festivals, weddings, or any kind of celebrations. Traditionally Sekihan is made of all sweet rice (you might call it sticky rice, glutinous rice, or mochigome), but 100% sweet rice is pretty filling and sort of heavy on the stomach, so a lot of people add regular rice (Japanese premium short grain rice). Azuki beans are commonly used in Japanese sweets and we used the azuki paste (we call it An) to put in Mochi, Manju, Dorayaki (Japanese Red Bean Pancake), Red Bean Ice Cream, and so on. It’s one of my favorite ingredients in sweets, similar to chocolate for Western desserts. 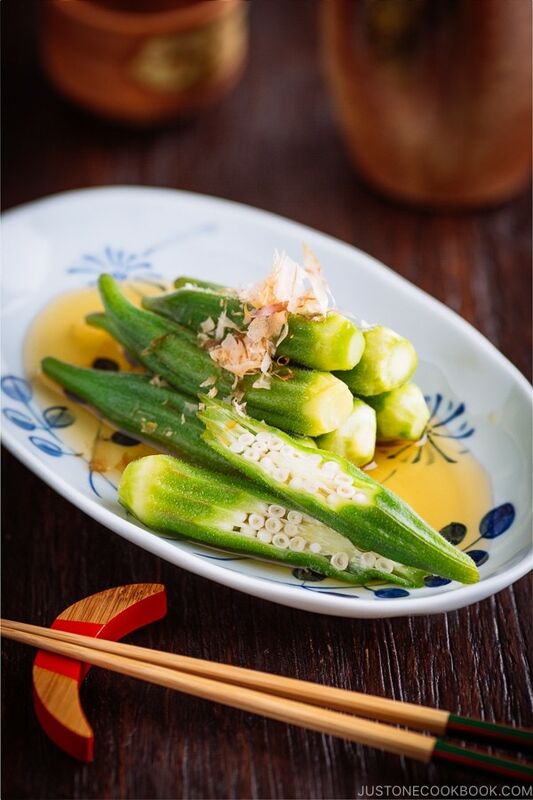 The unique thing about Sekihan is that we sometimes serve it at room temperature. 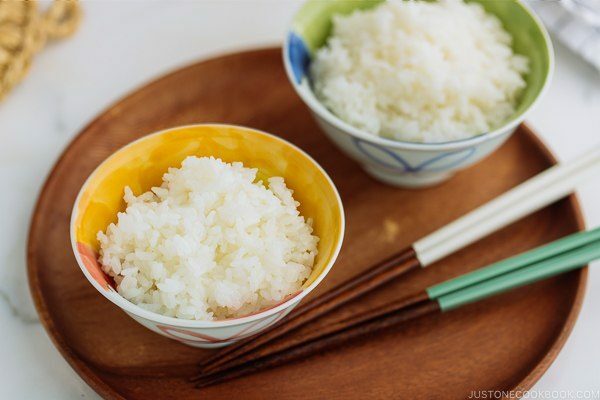 For regular steam rice we don’t do that unless it’s served as rice ball (Onigiri). 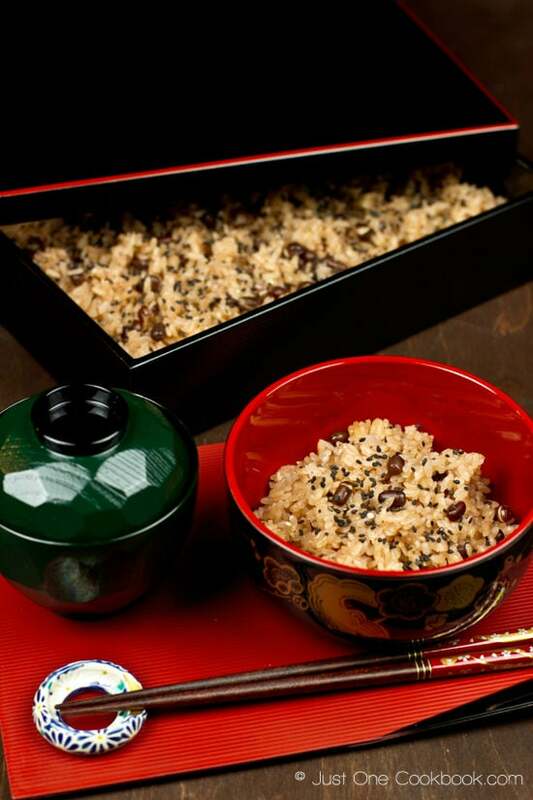 Sekihan is usually sprinkled with gomashio (a mixture of toasted black sesame and salt) over the rice before serving. We enjoyed this special rice with my mom and wished together we will have a happy and healthy life this year. By the way, my mom left for Japan yesterday which means I’m finally back on blogging full time after 4 weeks of vacation. We had a great time while she was here and my children miss her very much already. We’re planning to visit Japan and Taiwan this summer to let the children spend more time with their grandparents. I’ll be catching up this week on your comments and emails (yes finally!). Wash azuki beans and soak for half day (over night). Combine both rice into a bowl and wash rice (See Step 1-4 on How To Make Rice). Drain the rice for 30 minutes. Put azuki beans in a small pot (don't use a large pot). Put water to just cover the beans (you don’t want to put water too much here) and bring it to a boil on high heat. Once it boils, turn off the heat and transfer the beans into a sieve to drain water. Put azuki beans back in the pot and add 2½ cup water. Bring it to a boil on high heat. Once it boils, turn down the heat to low and cover the lid. Keep it simmering for 15 minutes (it depends on Azuki beans). Beans are done when you can smash a bean with fingers. When it’s done, reserve the cooking red water and beans separately in a bowl. Use plastic wrap to cover the beans so it doesn’t dry out and crack. Let them cool down completely. Add rice into the rice cooker bowl. Pour the reserved water in the rice cooker bowl until 3 cups line for Sweet Rice (or little bit below 3 cups line for White Rice if you don’t have Sweet Rice option). If you don’t have enough reserved water, add water to make it to 3 cups. Then add beans and salt. Mix and start cooking. When it’s done cooking, keep the lid close for an additional 15 minutes. Stir the rice gently and serve. Sprinkle gomashio or toasted black sesame if you like. I’ll have to try it too,is it ok to use only short grain rice? I cannot get sticky rice. Hi Mitinita! Hm… This dish is actually sweet rice dish so I have never heard of using regular rice to make it. I know already that texture is different, not sticky as sweet rice… You will be a pioneer for making the dish! If you get to try it, would you let me know how it goes? Someone else called me a pioneer as well when I tried making umeboshi in Romania:)) It was very similar to what I tried in Japan, the shiso leave had to be left out,though. You are really impressive!!!! I love using chopped umeboshi as ingredients! I’ve heard of azuki beans and rice, but never tried it. Thanks for sharing this recipe, it sounds delicious and nutritious too. Glad to hear you had a wonderful time with your mom, Nami. This looks really yummy! How interesting that the azuki bean is also associated with celebrations for Chinese culture. I have been craving for azuki bean soup for the past few days but got held up with my upcoming travel. Can’t wait to make the dessert & to try out your Sekihan recipe when i come back! The water really gets red from the beans, not like the red beans we ususally cook. I’m a big beans and rice fan and I would love this meal. The rest of my family, not so much. Oh well more for me. I’m happy that you’ve had a long vacation and got to spend time with your Mom. 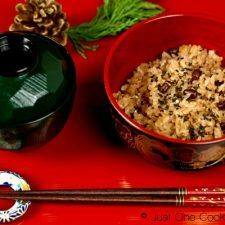 This rice is new to me..The Azuki beans look very similar like red bean..Now I learn one more Japanese traditional dish! This rice look great! Thanks! I’m going to get adzuki beans next I go to the store – great way to get good vitamins in sticky rice! So glad you had precious times with your Mum and the children. It’s great that they’ll see each other again soon enough! Welcome back Nami to full time blogging 🙂 But you deserved a good break and to spend some good quality time with your family! I’ve tried making this dish before and it didn’t come out the way it did when my sister made it. Is there a way to make this without a rice cooker? I hope you had a wonderful New Year! Interesting! I’ve never had this, but I love learning about things like this on your blog 😀 I love that it’s fairly simple, but it looks great. I’m glad you had such a wonderful visit with your mom…I loved seeing your smiling faces on facebook! 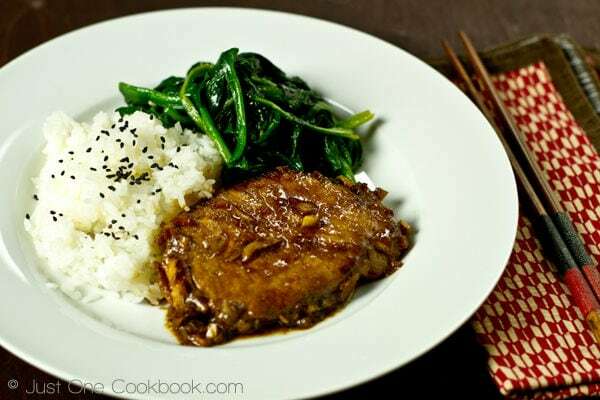 And what a beautiful rice dish…I know both you and your mom enjoyed cooking together! I love “azuki”. Here it is called Adzuki. I cook in rice as well as separately to eat with rice. This dish looks so beautiful and delicious. I have never tried any of these ingredients! Would love to try this if I ever get my hands on them. Ironically I am eating rice and bean now for lunch. but your version looks quite a bit yummier. Glad you had such a great time while your mom was here. I love reading about New Year’s foods! So cool you’re thinking of going to Japan this year. Looking forward to your posts! 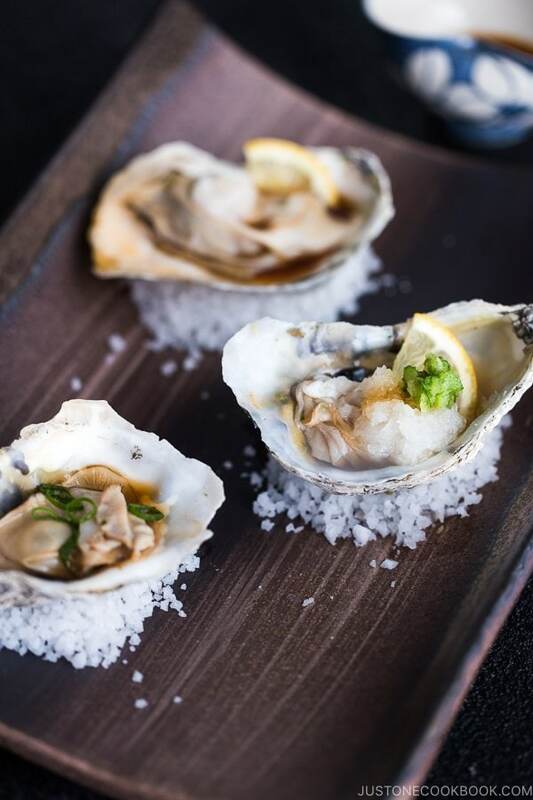 Nami, this dish looks terrific! It’s also so interesting to discover Japanes New Year’s dishes! Actually it’s as if you made it especially for me 🙂 In fact, I have bought a bag of azuki beans recently and still haven’t even opened it! Now I have no excuse! Nami, it is hard being away from parents and family, how long does your mother usually visit? My parents come down to Florida for a month visit in Feb, we celebrate some missed holidays during that time. Sekihan is one of my favorite Japanese dishes. Sometimes I shape it into rice balls. It has been a while since I made sekihan. Looking at your pictures make me want to make them soon. I love aduki beans, so glad that you posted this. I think adukis are a much lesser known bean. Sounds like you had a wonderful and very busy vacation and visit with your Mom. Have a wonderful day. Never made it, but I have a friend in Japan with a sweets’ shops and they make a good one, they always gave me some!. Ciao and… did I say happy New Year to you already??? I have been on and off with the internet and forgot who I managed to visit these days or not. Anyway, Akemashite Omedeto Gazaimasu!!! I remember Azuki from your Japanese Pancakes, this dish looks lovely Nami. Have a great day! This sounds great Nami! I love learning about traditional dishes. I also like how you used several different types of rice. I’m such a rice lover! Hey Nami! This reminds me so much of the Southern dish Red beans and rice! Except you use the smaller red beans and different seasoning of course! This is interesting because Chinese people enjoy red bean soup as dessert, though I’ve never had them with rice before, look delicious and such a comfort food! I hope you are going to enjoy some normalcy, blogging twice instead of 3 times should hopefully give you some free time to relax and enjoy yourself. Have a good evening! I did not realize that this rice has 2 different rices…love it with the glutinous rice. Beautiful color and so tasty. This looks amazing! It’s so nice that you and your mom made it together and that you were able to spend time together. That is wonderful that you’ll go to Japan and Taiwan this summer. Your children are so lucky! thanks so much for this – i love azuki beans and never know what to do with them once i buy them. just shared on my facebook page. happy new year! I’m a big fan of rice and bean dishes and this one looks delicious! Glad you had a nice time with your mom! It is a simple dish, but it is so Pretty! I love your attention to details. I make azuki bean curry alot, I love their flavor but again that’s a savory dish. So this one will be totally new. This looks delicious, Nami! And so simple to make as well! It actually reminds me of a chestnut and sweet potato rice I saw on a Japanese blog – have you ever tried that before? They too used glutinous rice. Did you know that Nicaraguan people also eat very similar rice? They also have a dish which is almost look like tonkatsu! Hope you guys had a wonderful time with your family! Let’s get together very soon! Ohh, so beautifully arranged in your lovely box. Love osekihan! the azuki beans really impressed me, because i’ve never know about it. we have japanese shop available in the island and i definitely want to buy it and trying your recipe:) hmm, cant wait! Happy New Years Nami! I saw you were in LA for a minute before you headed down to SD. Dont forget to call next time when you have more time. =) I made ozoni and buta no kakuni to celebrate the new year. What a delicious rice dish! I’ve never had red beans in rice. Must try this one. Thank you for sharing this with us. Glad you enjoyed your Mom’s visit, Nami! Welcome back! I love beans and rice, but I’ve never heard of a Japanese version. Yours looks wonderful! I’m glad you had a nice visit with your mom! Nami, I just saw azuki beans last week at the supermarket here. I’m going to try your recipe very soon. Thanks for sharing it with us! Ha! I have heard about the tradition but have only tasted red beans in mochi and steamed dumplings so far! And may I say how appitizing your presentation looks! Was it your personal idea to serve the rice in a box like in the background of your photos or is it the traditional way? Congratulations on your blogiversary! It’s amazing that you have been awarded with such a fabulous honor! Sugoi!! Your blog attracts so many hungry-foodies who appreciate your thorough instructions of cooking and stories behind each dish. I, as a Japanese, also learn something valuable and new every time I visit here. Sekihan is so delicious! I think sekihan is a special rice for every Japanese. I even like the color of the rice and texture. Celebration with sekihan is the one you would do for your award-winning beautiful blog! That dish indeed looks very auspicious! We do lentils on new years because the symbolize money. Mmmm! A fun and beautiful way to start the new year 🙂 Sorry to see your mum go but happy it means you’ll be back to full time blogging. And I’m already looking forward to hearing about your summer travels! I haven’t had azuki beans in a while. ^^ I need to make this quite soon. Hello Nami-san! I’m Japanese who lives in small city of Midwest, and my FB friend introduced me your site before, and I’m totally hooked since then! Lots of beautiful Japanese dishes make me feel missing Japan so much. (I haven’t visited there for almost 7 years now..) But I make Osechi for my family every year and we love it! Oh I made a 5-3/4qt pot full of Azuki for tsubuan on New Year’s day. I love tsubuan, so I freeze them so I can make dorayaki anytime! (love to get a Taiyaki maker someday!) I totally forgot about Sekihan though. I used up all of my Azuki beans, so I need to buy some for making Sekihan later. Hello Karin-san! Thank you for following my blog! You made Osechi? Wow! My husband doesn’t like Osechi and my kids are not into it as well. You are so lucky your family enjoys it with you (although I only have a few favorites and I don’t care the rest). I love tsubuan more than koshian. I had ozenzai after Kagami Biraki. I can eat anything with red bean anytime! We have a Taiyaki shop nearby and I always order anko one (they have nutella, vanilla, and all other kinds). Thank you for writing! Glad to have you back to blogging. Must have been nice to have mom around. I have not ever heard of this dish…seems yummy! I know it is a bit sad to have your mom go, but selfishly I am very glad that you are back and blogging. This looks so very delicious. I have never had sweet rice…do you have to purchase it in an Asian market? Hi Rachel, I have never looked sweet rice in American store, so I can’t guarantee they have it… Maybe Whole Foods might have it. I usually get it in either Asian/Chinese store or Japanese store. I’m not sure I’ve ever had Azuki beans. Your dish looks spectacular–I’m always so happy to see your posts, because they are continuing my culinary education. I am so jealous of your gorgeous plates and bowls! Love them. But I’m sure the food in it is 10x better!!!! This looks wonderful Nami! I had no idea that beans were popular in Japanese cooking. Your recipes are the ones I would love to try when I am looking for a healthy meal with a touch of simplicity. Love the simple rice and beans combo! Welcome back – and it sounds like you had a great time off! This looks delicious and I like foods a room temperature – it give the flavors a chance to meld. This looks terrific and it’s nice to see you posting! This looks awesome Nami! Even the dish and utensils are pretty! Hope you had a wonderful holiday and a happy new year! Yum! I would love to try this recipe. Thanks for sharing! This looks great! I love finding ways to use ingredients that I’ve never heard of or tasted! Happy catching up! Haven’t tried sekihan, but being a rice lover, I’m sure I’ll enjoy this! You know how much I love Azuki beans, and this combination with rice is just amazing and very tasty! Love your presentation and photos too..Every time I come you amaze me more and more!!! Thank you for sharing this idea!!! Hi Nami! I *love* the beautiful vibrant colors in your photos here!! Your items are so beautifully arranged and the pictures are so attractive! I especially love that ring-shaped chopstick holder – it’s so elegant and unique! Excellent find! I’m also glad that you got some time off with the family. You deserve it! I’m not quite back into full swing of things yet (I’ll tell you why later). But I hope to get back into a more regular schedule soon! Nami, this dish looks great! 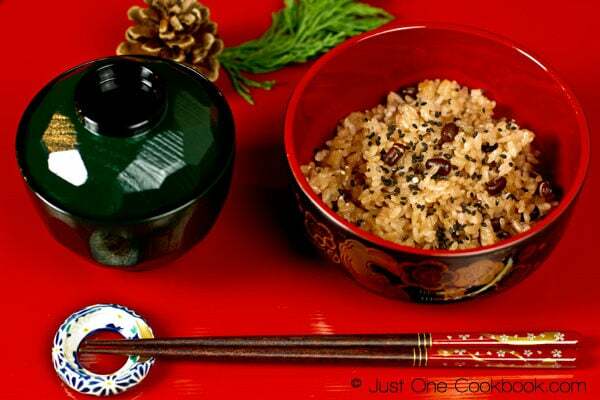 I love rice and beans combination, and it was great to learn about the Azuki beans and learn how to cook them. As always, beautiful presentation. I’m a big fan of Caribbean rice and beans and this dish sounds like a good change to my usual dish. Have a great week, Nami! Looks beautiful Nami, as always 🙂 I hope you’re having a great week! 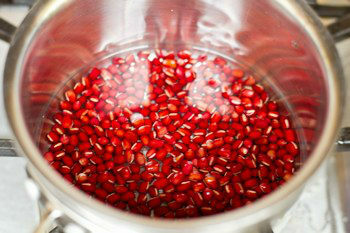 These beans are beautiful and so red – I can’t wait to find them and try this recipe. You always come up with so many fun and unique dishes I want to try. Glad you had a wonderful vacation and time with family. I too am just now getting back to blogging after vacationing with my family as well. Wishing you a Happy, Healthy, New Year! Glad you were able to spend a nice vacation with your mom. Its always wonderful seeing family when you live so far away from them! Its good to have you back to blogging 🙂 This rice dish looks so wonderful! I realised too how difficult it is to keep up with my blog when my sister came. I have to start writing down all the new rice dishes I have learned aver the past months. 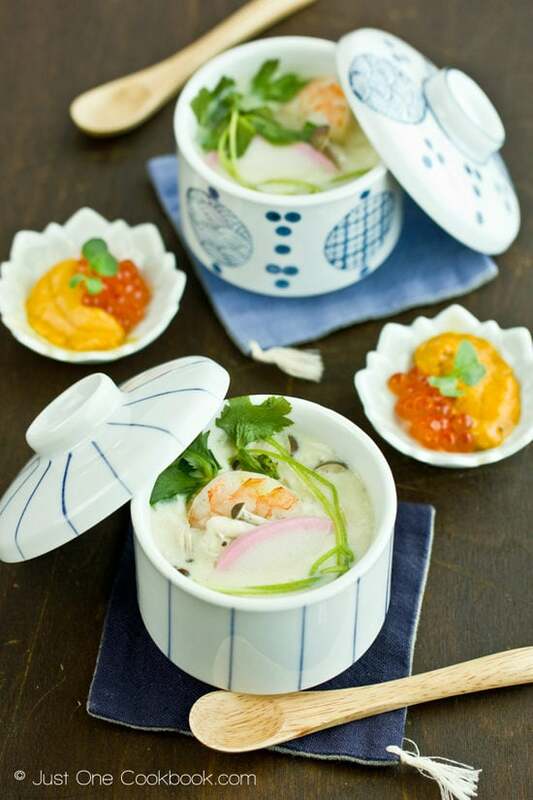 I d love to have a spoonfull of your sekihan, looks very healthy and delicious. my stomache is having troubel these days digesting beans. Do u think your recipe would cause some troubel to my tummy? Yes, you guessed correctly. 🙂 It is only for cleaning. That’s why you need minimal water in the first step. I have actually always wanted to make sekihan for years after I saw the recipe in my Japanese cookbook, but so far I’ve been too lazy ;). Could you also one day feature a recipe for Osechi, Nami? I love to look at those beautiful pictures of Japanese Osechi, I want to make them too, but don’t know how :(. Hi Nami. Long time no talk. I miss you very much. I’m so glad you had a wonderful time with your mum and family. So happy for you. I love this recipe… in fact I love anything with azuki beans! I love adzuki beans and had this dish in Japan a couple of times. Love your version too Nami! Japanese azuki beans are more fragrant and flavourful as compared to Chinese azuki beans. We use them to make Chinese tong sui (sweet dessert). I must try your recipe one day. Looks so delicious! Thanks for sharing! (Not sure my previous comment worked. Sorry if it is a doublon). Hi and thank you for this goo website. Usualy recipes call for rice to be cooked in a rice cooker or in a pot with water. Yet in some books, the rice is laid on a clothe in a bambou steam basket on top of the pot. The rice is then covered with the clothe and during the cooking time some liquid is adding directly on the rice. Does this second method have a specific name? What are its pro and cons taste wise? Hi Adrien! I didn’t see your first comment, so I’m glad you left another comment again. Sorry about the trouble. In your instructions Is this a misprint? or Should this be “soak” the rice for 30 min? Hi Gene! I responded to you via email, but I’m responding again on the comment in case others have a same question. This recipe is awesome! I was just looking for the recipe that my grandmother used to make and I found it. Thanks a lot! 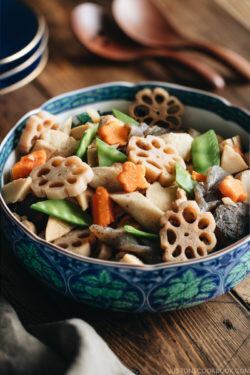 My japanese mother is no longer able to make this and my kids had been bugging me to find out a recipe. Well, we finally tried it this weekend and thank you so much, we are once again enjoying a favorite dish. I couldn’t believe it was this easy. Thank you so very much for all your wonderful recipes. I tried the sekihan today and it was great. Hi J! I’m so happy to hear you liked this recipe! Thank you for trying this recipe! Happy holidays to you and your family! Hello, Thank you for sharing your recipes. I have used your sweet red bean paste recipe and am going to try your sekihan recipe next. My son’s girl friend is from Japan so I am trying to learn how to make dishes she will enjoy! I haven’t used this recipe but every time I make sekihan, the beans are always too hard no matter how long I soak them ( I have tried soaking them for a week once) or boil them. Is there something I am doing or does this mean the beans are old? I have a question. When the recipe calls for 2 1/2 cups of water…is that the rice cooker cup or a standard measuring cup? Thank You, Nami-san for your response to my question about measuring cup for water. You said to use a standard cup measure….., that is what I did. I was making sekihan to take to a church pot luck meal for this past Sunday. I followed your recipe and it was a big hit and I was very proud. (I ordered some heirloom adzuki beans (Hokkido) and I already had sweet rice. I cooked it in a Jirurushi rice cooker. I was very surprised by how quickly it cooked ….about 7 mins. I was interested in your recent travel report about Kyushu….I am married to a man who was born and raised in Fukaoka prefecture and we have visited many time over the years. My two favorite places in Kyushu are Yanagowa and Ufuin (we were in Ufuin in the springtime and saw the wild azaleas on the mountain side. My third favorite place was a side trip from Ebuski…to an outdoor resturant where they had tables with whirlpools of swirling water and they put the somen in the cool fresh water from the Mountains. There were fish swimming in pools and streams ….. they may have been on the menu too ???? we just had the somen and dipping sauce. Hi Bond! I’m so glad to hear your church friends enjoyed it! Wow with your Hokkaido azuki beans I’m sure it was extra delicious! You have been to Kyushu! It was really nice trip and we can’t wait to go back again next year. Yufuin was nice too. We need more days to travel around the entire Kyushu as it’s big! Thank you for sharing your story with us! Can I please ask what do you usually eat the sweet rice and red beans with? Like fish? Vegetables? Pickled foods? Thank you for finding out the error. It’s been fixed. Hi Nami, I was wondering if you have ever used canned azuki beans in this recipe? Hi Kari! They are cooked and sweeten, right? For this recipe, you will need to use actual beans as flavors will come out while cooking the beans with rice. Hi Nami, one question. In step 8 you mention adding beans twice. When should they go into the pot, before or after adding the water? Thank you!